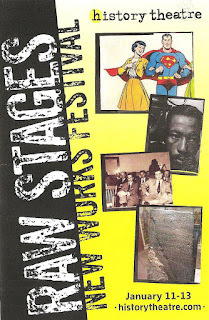 Last weekend was one of my favorite weekends of the year: "Raw Stages" weekend at the History Theater in downtown St. Paul. Most of the work produced by the History Theatre is new work that they develop, a claim few theaters of their size can make. Specifically, they produce plays and musicals inspired by local history. Usually some part of history that's not well known, but somehow relates to the modern world and helps us gain insight into where we are by looking back at where we were. An important part of the development process is their annual new works festival, in which four new pieces receive a director, cast, workshop, and public reading. I was able to attend two of the four readings this year, both exciting and promising works that I hope to see on the stage next season. But first, History Theatre's current season concludes with three HERstory plays - world premieres by and about women (click here to find out more). A transgender woman becomes the deputy mayor of Saint Paul. My thoughts: I wasn't able to attend this one but hope to have another chance, it sounds like a great and inspiring story that I've never heard. In researching the photographer Gordon Parks, a writer is transformed. My thoughts: Friends, this is one of those experiences that transcended theater. Even though it was "just a reading," it felt bigger. The great-niece of acclaimed black photographer (who BTW also directed the iconic blaxpoitation film Shaft) Gordon Parks began the reading by calling in the spirits of her ancestors, and after the reading introduced young students "following in his footsteps." In between the past and the future, a talented cast read this promising new play by Harrison David Rivers (my favorite artist of 2018 shows no signs of slowing down), directed by former #TCTheater artist Jamil Jude, back for a welcome visit. The play juxtaposes two stories: Gordon's story growing up poor and black in Kansas City and St. Paul, working as a waiter and busboy, and discovering his passion for photography; and the story of a modern playwright writing Gordon's story and finding parallels with his own. Racism, artistic drive, family, sacrifices, and using art as a weapon to fight for social justice are just a few topics explored in the play. While it's currently a bit too long at three hours, Harrison freely admitted that and promised to edit out the unnecessary, and the addition of Gordon Parks' photographs in a full production will only make the words and the story more meaningful and true. A 1960's family forced is from their home for opposing segregation in Minnesota housing. My thoughts: I did not attend this reading, but I saw last year's reading and am glad they're continuing to develop this local story that needs to be told. Cast: Adam Qualls, Jim Lichtscheidl, Amiee Bryant, Eric Morris, Katie Bradley, Nathan Barlow, Sasha Andreev, Evan Tyler Wilson. This musical can only be about one thing - the Kensington Runestone. And it is. My thoughts: And it's just as much fun as it sounds. I admit, I had to google Kensington Runestone to remind myself what it is. But for people who grew up in the area near Alexandria (some of whom were in attendance in the reading, and also includes the playwright) are very attached to this story. The musical is constructed as a conversation between researcher Frannie Blehr and Olaf Olman, the man who found (or clams to have found) an ancient Nordic Runestone on his farm in Minnesota. In the early 20th Century version of "going viral," the stone became a national and international sensation as its validity was debated, as the musical recounts, bringing in the stone's biggest supporters and critics. I saw some shades of The Book of Mormon (I found something buried in my backyard and totally believe it's real! ), but it's mostly a fun original tale. We only saw Act I, plus three songs of Act II, which the creators said will delve more into the darker side of the effects on Olaf's family. The music is fantastic, although I'm not sure I'd call it a rock musical at this point, but the composer was only give a few days notice of that, and instrumentation in a full production will also help create that feeling. This musical has been in production for 10+ years, and I'm excited to see it come to fruition.